You are what you eat. It's a saying as old as written history. Throughout every culture, people have known this simple truth since the dawn of Man (and Woman). But before we can even talk about the consequences of "bad" food choices for a nation, we have to engage in some honest talk about what "bad" foods really are. It's a sobering discussion, too, because most people follow atrociously bad diets... Including many people who think they eat a fairly healthy diet. Perhaps 90 percent of the U.S. population eats a "bad" diet right now. The official government definition of a bad diet is nonexistent. The USDA wants Americans to eat more of everything: More dairy, more meat, more grains, and even more sugar. That's because these are the industries served by the USDA. In their minds, "poor nutrition" just means people aren't eating enough dairy, meat, grains and sugar. The USDA remains stuck in the mindset of the 1930's when people were literally starving from a lack of calories. So their policy incessantly remains "Eat More!" But Americans don't need to eat more. They need to eat less. A lot less. And especially less of the highly toxic, disease-promoting foods described below. • Lacks large quantities of fresh, living fruits and vegetables. • Avoids adequate water hydration (and focuses on manufactured beverages). • Very high in processed sugars and processed carbohydrates. 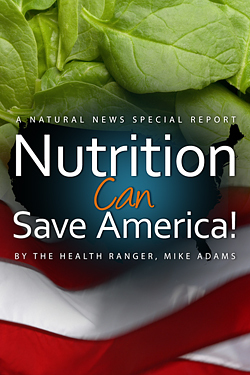 • Contains genetically-modified foods such as corn, soy or sugar from GM sugar beets. • Includes a large amount of processed, pasteurized dairy products such as cow's milk. • Is made with hundreds of different chemical food additives from MSG and aspartame to chemical preservatives. • Is packaged in toxic food containers, including plastics and epoxy resins that contaminate the food with BPA. • Primarily consists of conventionally-grown, pesticide-contaminated foods. • Contains a large quantity of unhealthy oils such as corn oil, soy oil or partially-hydrogenated oils. • Consists of a large number of fried foods or foods cooked at very high temperatures that destroy nutrients while creating carcinogenic compounds. • Is made with many modified, unnatural ingredients such hydrogenated oils, refined sugar (which removes the minerals), homogenized milk fats, and so on. • Consists of a large quantity of animal products. As I mentioned, perhaps 90 percent of the U.S. population currently eats a diet that's largely consistent with the above description. As you'll soon see, this is destroying our nation.